Can you feel the love? Valentine’s Day is (almost) here! The holiday will soon be upon us, and for marketers, this is big news. Valentine’s Day presents a perfect opportunity to take advantage of and utilize in your marketing efforts. Like many holidays, Valentine’s Day gives you the chance to play off of popular topics and create messages your consumers can connect with. So how do you plan on using Valentine’s Day in your marketing strategy? If you’re not sure yet, here are some ideas for how to show marketing love this Valentine’s Day. 1. Use charm in your email marketing. 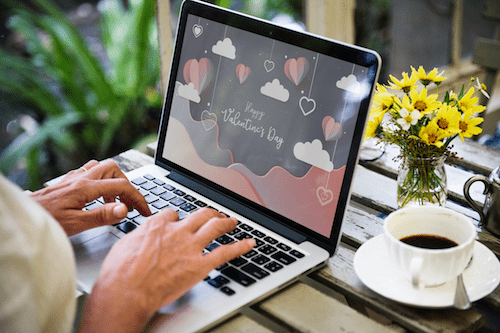 If your business is active in email marketing, then Valentine’s Day is a great opportunity to swoon customers even more. Don’t be afraid to incorporate a bit of the holiday’s charm into your email’s subject line, content and call to action. For instance, “We’re in love with these Valentine’s deals,” is a catchy line that relates to the holiday and encourages customers to open. Use a casual, engaging voice in the content, and include emoji where appropriate, for a little extra added charm. Valentine’s Day tends to be all about couples, so lean into the trend by running two-for-one deals on your products or services. For instance, incorporate a “buy one, get one free” offer that plays on the idea of being coupled up. Even if your business focuses more on services, you can always throw in a hint of love. For example, a print company might run a promotion on “buy 50 wedding invitations, get 50 free.” No matter what your business is, brainstorm ways for how you can play off the idea of Valentine’s Day couples. 3. Spice up your social media. Share the spirit of the season with your followers on social media by spicing up your accounts with a bit of Valentine’s Day flair. Post a photo or two about the holiday, and don’t be afraid to get creative and romantic with it. If you plan on doing an entire Valentine’s Day marketing campaign, then incorporate matching images into your social media cover and profile photos. Social media marketing is a massive platform for companies to take advantage of, particularly during holidays, when customers feel more engaged. 4. Create a Valentine’s gift guide. Whether you’re an early shopper or a procrastinator, we all love buying (and getting) gifts for Valentine’s Day. Connect with your customers on a personal level by creating a Valentine’s Day gift guide for them to utilize. Choose a theme such as romance or self-love to base the list around. Then, include some of your own products or services alongside a few from other non-competitor sites. A gift guide is the perfect way to provide useful content your customers will enjoy, while still showcasing ways to buy from you. 5. Send customers a card. This might seem a little retro, but sending your customers a physical Valentine’s Day card is a great way to show how much you care. While most brands focus their holiday marketing online, you can stand out from the crowd with a more traditional technique. Plus, many customers probably receive quite a few emails already, so a surprise Valentine could be just what they’re looking for. Avoid “sale-sy” language, and instead focus on telling customers what they mean to you, thanking them for their support and offering a special discount. Valentine’s Day is quickly approaching, but there’s still time to jump on board the holiday marketing train. Keep these ideas in mind and see how you can incorporate them into your campaigns so more customers will fall in love with your business this Valentine’s Day.